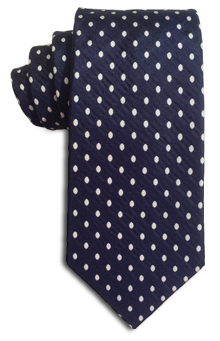 You've heard it before -- "classic with a twist" -- but that's what this is.Ovaltine is classic because it's a white polka dot tie. But the twist is two-fold. First, the underlying fabric has a searsucker feel -- you won't see it on your computer screen, but it's subtle and cool. And second, the dots are not perfect circles, but ovals instead. Which is perfect. 100% woven silk. Made by hand.